There’s a reason Florida is called the Sunshine State. With warm weather and bright days year-round, people of all ages are flocking to the luxury vacation locale with stars — or rather, the sun — in their eyes. So, you’ve got all this sunshine, why not take advantage of it? 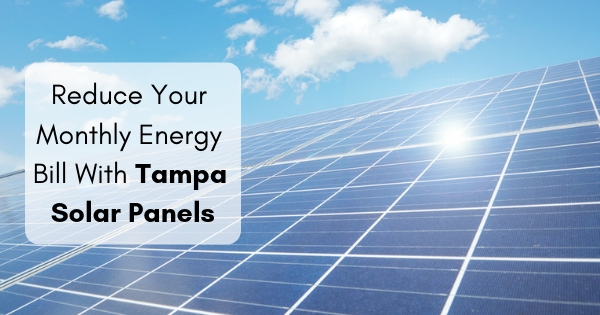 Tampa sees approximately 246 days of full sun every year; when you look into solar panel installation Tampa opens up to you. After a simple setup process, the Floridian sun goes to work powering your home. As wonderful as sunshine is, it comes with an occasionally-unbearable partner: heat. In the height of summer, temperatures stay consistently in the low 90s: when you take into account how much money goes into cooling your home so you can tolerate such oppressive heat, the opportunity to reduce home energy bills becomes too good to pass up. With Efficient Home Services at your side installing Tampa solar panels, you are able to harness the very thing that’s causing your bill to spike each season. Efficient Home Services cares about saving your money. We are committed to doing all we can — from Tampa solar panel installation to HVAC unit evaluations — to ensure your home’s energy system is as efficient and cost-effective as possible. Our core values of honesty and fairness allow us to produce superior workmanship and offer impeccable customer service on a routine basis. If you’re not sure, give us a call: we will give you a free evaluation of the energy use in your home and explain areas that could use improvement. When you work with EHS, we perform a free energy audit, meticulously examining the nuances of your energy use, and even take a look at your previous 12-13 months of electric bills to calculate what you could be saving. And if that’s not convincing enough, we offer an exclusive guarantee: if you’re not saving the amount of money we promised within a year, we will come back and solve the problem. Stop paying exorbitant energy fees just to keep your home cool in the Floridian heat; partner with EHS and experience a greener way of living.